People keeping an eye on the github repository of FSE may have noticed the apparition a new function, called FSE_normalizeCountHC(). Let's detail it. The previous post presented some new technique to improve accuracy of the normalization step, while remaining fast. The post of today will concentrate on making the normalization step "optimal", keeping an eye on speed as secondary objective. Reaching the "optimal" status means no other probability distribution can achieve a better compression. This is obviously measured against a "theoretical optimal entropy coder", which FSE is not (it's a close approximation of it). But still, any gain from a better distribution is likely to translate into better FSE compression. To achieve the best possible distribution, we need to inverse our reasoning : instead of distributing remaining "bonus points", we will round up everyone, and then consider that a "round down" is a cost. This cost is necessary : we can't "round up" all probabilities, otherwise the sum of probabilities will be bigger than the table. By design, some of these probabilities will have to be rounded down. We will simply select the ones which will cost less. This requires to define a "cost function". Now, we want to evaluate the cost of downgrading the probability of S from P to P-1. We can calculate this cost for each and every symbol present into data source, and then pick the one which cost less, degrade its probability note by one, update its cost, select the new symbol with lowest cost, rinse and repeat, stop when you have reached the required total (= table size). By construction, this method is guaranteed to provide the best possible normalized distribution. So, what kind of result does it provide ? As can be seen, the remaining gain is very small. That's because we already grabbed most of the benefits from latest improvements. Still, it can be interesting for those willing to reach the best possible compression ratio, since the "normalization" cost only applies during compression, it's totally free on the decompression side. 1) The first selected symbols make a big difference, since they really cost much less (starting with 413 bits). Then, the costs tend to converge, and there is very little difference remaining between the various available choices beween 535 and 545 bits. Basically, it means most of the gains for the "HC" versions came from correctly selecting the first few symbols. 2) These first symbols tend to have "low probability" : a lot of 2->1 transitions, some 3->2, and so on. Starting with 530 bits, they completely disappear, and we only have higher probability symbols. 3) Some higher probability symbol appear several times. Note for example symbol 32, which is rounded down several times, reaching 332, while its "real" probability should be 334.47. It means it's better to downgrade it several times, rather than to downgrade a single time a lower probability symbol. The point 2 was the most surprising to me. Remember last time we showed a graphic proving that the low probability symbols were prone to the most important "round down" losses. The new result implies that low probability symbols are also susceptible to generate the lowest amount of losses, when they are at the other end of the spectrum (e.g. 1.01). As could be guessed, this "level of freedom" is much higher at low probability than at high probability. In fact, the "freedom area" quickly becomes a very thin line beyond value 300. From 1.01 to 1.99, the level of freedom is a factor 2. From 2.01 to 2.99, the level of freedom is now 50%. By the time it reaches probability 1000, the level of freedom is basically 1/1000th, which is almost nothing. This is the zoomed version of the same graphic, concentrating on the first few values. As said last time, this graphic will remain the same irrespective of the total size of the table. So that means that most of the attention must be paid to the symbols with lowest probability, where the difference between a low and a high "fractional rest" can make a large cost difference, and therefore should be selected carefully. High probability symbols don't have such level of freedom, and therefore their "fractional rest" has very little importance, and almost no impact on total cost. 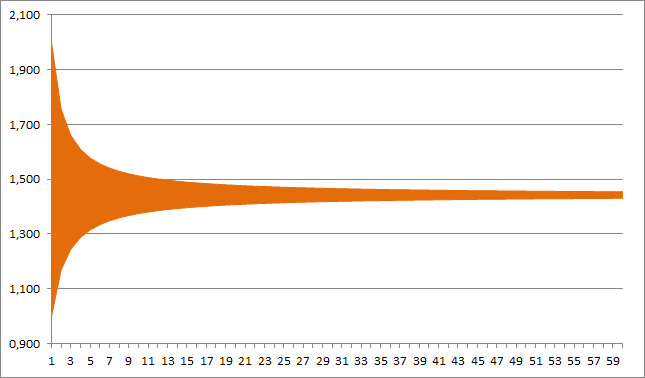 Another interesting point is that the graphic converges towards 1/ln(2) = 1.443, not 1.5. Which means that the intuitive 50% threshold is not true, at least not for low-probability symbols. Unfortunately, the new "HC" version is also slow. Not "horribly slow", just slow enough to be noticeable in benchmark, reducing total speed by as much as 5-10%, for a negligible compression gains. That means the "fast" version remains the default one, while the "HC" version is provided in option. Nonetheless, the above findings are very interesting, and may be useful in the quest for a better fast renorm algorithm. A secondary issue to deal with when implementing an FSE entropy coder is the requirement to normalize statistics. Basically, it consists in attributing a probability to each symbol, so that the sum of all probabilities = table size, which is itself a power of 2. It is in no way specific to FSE, and any other entropy coder with the ability to represent fractional bits, such as arithmetic coders, would face the same issue. 1) Ratio is a float number (since in practice input Size is a non numeral multiple of table size). It basically means all calculations are going to be float, which is hardly ideal for speed. This part is the easiest to solve : just use some fixed-point arithmetic. It's particularly simple with 64-bits arithmetic : scale table Size to a large number, such as 2^60, and R becomes a large integer, with which you can multiply symbol occurrences. It's accurate enough. 32-bits arithmetic is fine too, but requires to pay a bit more attention to limit situations, such as large input sizes. 2) P[s] is unlikely to be a natural number. You will end up with something like P[s] = 10.1, or P[s]=10.9 . So the natural question is : to which value should be rounded P[s] ? With above examples, it looks simple : 10.1 should be rounded to 10, 10.9 should be rounded to 11. Except that : if you apply this simple logic to all symbols, the sum of P[s] is not going to be equal to table size. It's going to be close, but not exactly this number. Which is unforgiving : this strict condition is mandatory, otherwise compressed data will be corrupted. There are a few ways to handle this situation. A "panic" solution would simply consists in adding or removing some points to random P[s] until reaching the desired total. As long as all present symbols get a P[s]>=1, it's going to work. Compression will suffer, but compressed data will be decodable. This is obviously not very optimal. So let's try to find something better, keeping in mind the requirement for speed. The initial algorithm shipped within FSE was completely speed oriented : it would attribute a probability to each symbol in a single pass, guaranteeing that all present symbols get a probability >=1, and that the sum of them is necessarily equal to table size. 1) Statistics were altered, to guarantee that all symbols present get a probability >= 1. It simply consists in adding a constant to all symbol statistics, so that even when a symbol is present only once, (Occurence[s] + base) * R >= 1. 2) "Fractional rest" was tracked. P[s] was rounded down by default, but would be rounded up when the cumulative sum of current and previous fractional rests would be > 1. This idea is somewhat equivalent to dithering algorithms, but in 1D space. It works. It's not optimal, but damn fast. Note that we are not talking about a large loss here. It would typically be ~0.05% using a 4K table. Almost negligible. However, I also discovered that the error became larger as table size was reduced (up to 0.20% for a 2K table for example). Since one of my current objectives is to use smaller tables, I figure it was a good idea to investigate. Both mechanisms above introduce some distortion. The most important one is the statistics alteration. The effect is more pronounced when sourceSize / tableSize gets bigger, as one would expect, since the base alteration has to be increased. The second effect is less harmful, but still not optimal : the "round up" bonus is more likely to be attributed to symbols with a large "fractional rest", such as 10.9, but it's not guaranteed. If the remaining sum of previous fractional rests is very small, for example 0.05, the new sum will be 0.95, and therefore not trigger the round up bonus. On the other hand the next symbol, even if it has a small fractional rest, such as 10.1, would pass the total to 1.05, and therefore trigger the "round up" bonus. It's desirable to make a more accurate selection of which symbol probability must be rounded up or down. So the algorithm is going to be altered. The new idea is now : we round down all symbol probabilities by default, then we provide the "round up bonus" to the symbols which "more deserve it". We just introduce 2 new problems. First, we can't round down probabilities < 1. These symbols have reached the absolute minimum. We must provide them this probability of 1. That means, we now have 2 situations : either the "round down" of all symbols of probability > 1 is prevalent, and we still have some "bonus points" to distribute", or, the "round up" of symbols of probability < 1 is prevalent, and we must now remove some more from some other symbols. Let's suppose we are in situation 1 : we still have a few bonus points to distribute. So the initial reasoning is still valid. This lead us to the second problem : which symbol does "more deserve it" ? How to translate that ? An intuitive idea is that symbols with highest "fractional rest" deserve it more. Simply said, 10.9 should be rounded up instead of 10.1. This is simple case. But more complex choices have to be made too. For example, supposed I've got only 1 bonus point, which probability should be rounded up : 1.9 or 10. 9 ? To investigate this question, I've started to look at the impact of a "round down" error. Suppose I'm providing to symbol A a probability of 1 instead of 2, and to symbol B a probability of 10 instead of 11, what is the impact ? This is intuitive : the smaller the probability, the more a "round down" error will have an impact on symbol cost. But it doesn't tell the whole story. The symbols with smaller probabilities are, by definition, less numerous than symbols with higher probabilities. So it could be that, even though the "unit cost" of more probable symbols is less impacted, multiplied by the number of symbols, the total error may be larger. Well, it's interesting. Symbols with probabilities of ~30% do actually generate more compressed data than symbols with probabilities > 80%. Interesting, yes, but that's still the wrong picture to look at. The above picture gives the total amount of compressed data generated if the probability is correct. I won't get a smaller amount of data if I attribute a probability of 5% to a symbol which real probability is 30% : its cost will sky-rocket instead, following the trajectory of the first picture. What actually matters is "how much additional compressed data will be generate if I round down this probability". - Let's imagine that all probabilities are accurately represented (meaning, a symbol with a probability of 2 is really present 2 times). - What is the additional cost of this error ? OK, now this is really interesting. This is almost a flat line. The total error is consistently going to be around 1.5 bits. To be more precise, it's not "totally flat", it's in fact slightly diminishing, converging towards a value around 1.443 (seems to be 1/ln(2)). It generates a few comments. First, it's not an "exploding cost". It is capped, to 2 bits max, for the specific case of downgrading a probability from 2 to 1. Second, it converges very fast. 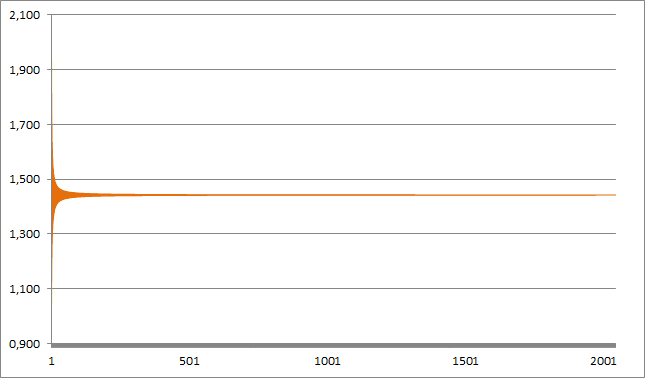 We almost reach 1.5 bits at probability 10, it then continues its slow convergences towards 1/ln(2). Another interesting fact is that this convergence is independent of the total size of table. This example is extracted from a table size of 2K, but you could have a table of 16K, or a table of just 32, and you would still get the exact same result ! This seems strange, but math explains it all. Basically, the term TableSize disappears from equation. Concretely, what it means for our fast normalization algorithm, is that using the "fractional rest" as the key metric to decide which symbol should get its "round up" bonus is correct. The gain is almost flat across the spectrum. It also gives a second key, to solve ties. Since the loss curb is decreasing with probabilities, it means that, for an identical "fractional rest", we have a bit more to gain when Probability is lower. And here we have our algorithm to distribute the "round up bonus" : select symbols with highest "fractional rest", solve ties by putting lower probability symbols first. quite the reverse situation : we have distributed too many probabilities, as a consequence of the requirement to provide a minimum probability of "1" to all symbols present even only once. So now, we must remove some points, somewhere, to reach the desired total. We'll deal with this situation quite easily. All symbols are already rounded down. So we have no more "fractional rest" to play with. We are going to downgrade any symbol by a full probability point. So we just look at the graphic. It simply states that, even though the loss is almost equivalent, it's still lower for higher probability symbols, even if marginally. So we'll give the entire cost to the symbol with highest probability. It's a fast approximation, and works well in practice. With this new algorithm, FSE now compresses a bit more. To give an example, let's compress book1 (part of calgary corpus) as a single block. And indeed, with lower table sizes, the increased accuracy becomes more important. The good thing is, the new normalization approximation algorithm is still very fast, and can therefore be used as a drop-in replacement of the older one, with no perceptible speed impact.